Target 1 face-up card on the field that you can place a Spell Counter on; place 1 Spell Counter on that target, then you can add 1 “Spell Power Grasp” from your Deck to your hand. You can only activate 1 “Spell Power Grasp” per turn. Is Breaker becoming relevant again and no one told me? Spell Power Grasp is a Normal Spell Card with no cost that can only be activated once per turn. You get to target one card that can hold a Spell Counter and put one on it. Then, you can search another copy of Spell Power Grasp from your deck to your hand. This doesn’t thin the deck fast enough and there aren’t really enough good targets for Spell Counters. This has the same problem as Crusader of Endymion, that being there might be times when you can’t use this card, even in its own deck. As such, avoid except for nostalgia. For Throwback Thursday this week, we look at an old Spell Counter card in Spell Power Grasp. SPG is a Normal Spell that lets you place a Spell Counter on a card you control that can take Spell Counters and then you can search you another SPG. Honestly a pretty good way to generate Spell Counters, especially considering most cards that use Spell Counters gain them when you use a Spell Card. SPG is a hard once per turn to keep it a little more balanced and so you can’t deck thin too easily. 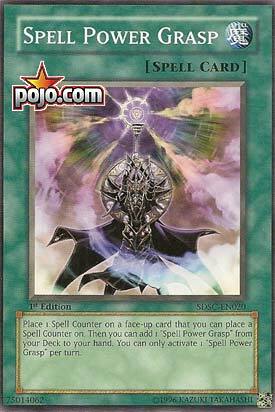 Still a solid Spell Counter card overall. Art: 3.75/5 Magicians can really master those Spell Counters.